I have always been obsessed with destiny and if you can actually change it. Growing up I'd study the lines of my palm, and wonder if one was just born with a set future or if you could make a conscious choice to change it. Experience has taught me, you are the result of your choices. Fia's story in Exhale explores just that. I wanted to explore a race of warriors who while being immortal had all the faults of humans. I had a vision of a group of these beings trying to change the future of the human race from the collision course it was on, by consciously mating with select humans to birth a race superior than any in the past. I wrote Exhale very early on as a 10,000 word story. I didn't realize that the Kris in Exhale is the same Kris who would later appear in Claimed, book 3 in the Many Lives Series. 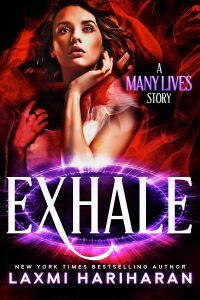 Exhale is both a story that inspired my best selling Many Lives series and a prequel to Claimed. He's close enough for me to see his eyes go light and when he swallows, the cords of his throat move. It draws my attention to that hollow at the base of his throat. And I notice for the first time the making of a tattoo, which peeks above his T-shirt. His chest rises and falls, his muscles stretching the fabric. I reach out to him with my being. My unseen touch shivers over those muscles down to his flat stomach. Edging lower, lower, over the front of his jeans. He groans and my eyes dart back to his face. Eyes shut, he tilts his head and bites down on his lower lip, "Not fair." His voice comes out heavy, deep, so thick I taste the desire in them. And then in the next breath, he reaches for the hem of his T-shirt pulling it off, and I gasp. Heat plumes off him, hitting me in the chest, flowing over me, enveloping me as if he’s physically covered me with his body. I touch his chest, tracing my finger over the tattoo that covers his upper-arm. It creeps up towards his throat, before flowing over his shoulder, down his back. He groans again, the sound torn out of him. It ripples up his throat, pulling at me, tugging me. Desire spools off him and I can smell him now. Smell his arousal. A musky vanilla tinged scent which yanks at my belly. But, it's too late. His eyes fly open. The pain in them reaches out to me, a swirling purple of desire, unmistakably sexual and deep and shot through with patches of red. As if he's in pain and holding himself back. The cord between us snaps into place, tugging deep inside my womb, and I gasp as a wave of nausea washes over me and my knees almost give out. "Stop it," I scream, "Stop. I'm not ready for this."